Hundreds of Chiang Mai people gathered at the Wing 41 air grounds last Wednesday evening to welcome Her Majesty Queen Sirikit, who arrived in the north to spend the winter months residing at the Phuping Winter Palace in Chiang Mai. 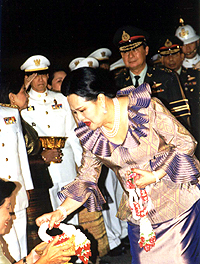 HM the Queen’s visit brings great honor to Chiang Mai and northern people, and especially for those who were granted an audience upon Her arrival. Led by Governor Suwat Tantipat, Chiang Mai provincial authorities, military officials, police and dignitaries, including international diplomats, gathered at the Wing 41 air grounds for the grand reception. HM the Queen was saluted by the Royal Thai Air Force military guard of honor, as well as the police and army that will keep peace and provide security during HM the Queen’s visit, bringing great honor for Chiang Mai and northern people, and especially for those who were granted an audience upon Her arrival. HM the Queen will reside at Her winter residence for the next few months. Whilst there she will continue to work with royally initiated and royally-sponsored projects, particularly the Foundation of Supplementary Occupations and Related Techniques (SUPPORT) under Royal Patronage. She will also visit villagers in rural and remote areas, as she has done in past years. Time for a radical rethink? Chiang Mai had 15 deaths and over 900 injuries during the New Year holiday until January 4. Chumporn Inthathep, head of Chiang Mai Public Disaster Prevention and Relief Operations Office, revealed that up until January 2, 706 people were injured, of which 525 were male and 181 were female, and 11 were killed - 10 males and one woman. After that time, up until January 4, another 4 were killed and nearly 200 more were injured. Hang Dong, Doi Saket, San Sai, Saraphi, Mae Taeng and Muang Districts reported one death each, and Chiang Dao district had three deaths and Fang district two fatalities. The Public Disaster Prevention and Relief Operation Office Head said that the most cases reported were motorcycle riders and passengers and alcohol was involved, especially in the outer district areas. The road death toll was likely to increase by many more than past years, by the time the long weekend holiday was over, already being 20 percent higher. Fifteen people were killed when a bus overturned after crashing into two pick-up trucks while running downhill in Wiang Pa Pao district on December 28, but were not included in the New Year statistics. Police said the tour bus was taking 65 passengers from San Kamphaeng district in Chiang Mai to a wedding party in Chiang Rai. High ranking officials from the Royal Thai Air Force (RTAF) joined Wing 41 senior airmen to celebrate their New Year party in grand style, with shows from the Sabun-nga cultural troupe as the highlight. The winning squadrons from the air operation competition line up to receive their awards. 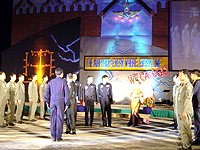 Wing 41, which is the Third Air Operation Division, RTAF, organized the party as celebrations for the Flight Operation Competition 2003 and prize giving ceremony for the winning squadrons in the competition. 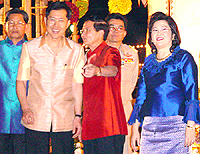 Being New Year, there was also the colorful end of year get-together to celebrate New Year 2004 by senior RTAF members. The closing ceremony and the party were held on the apron of Wing 41 and were presided over by Air Chief Marshal Kongsak Wantana, Commander in Chief of RTAF. Three tourists died on Doi Inthanon as a result of smoke inhalation inside their tent while camping. The tragedy occurred in the early morning of January 2. Warut Charoenchokepanitch awoke in the morning and asked Doi Inthanon National park officials for help, but unfortunately his wife, Ing-orn Charoenchokepanitch and his two sons Wasin, 11, and Siriwit, 9, had already succumbed. The Chormthong district police and park officials assumed the three died from suffocation inside the tent, due to a kerosene lamp and wood fire from the stove. “The three might have inhaled too much poisonous smoke from the burning kerosene lamp and the fire,” said an official. The Charoenchokepanitch family had traveled from Bangkok and arrived at the park on Thursday, January 1, to celebrate New Year on the top of the highest mountain in Thailand. The bodies were sent to Maharaj Nakhon Chiang Mai Hospital for autopsy. The government of Japan has decided to establish a Japanese Consul-General in Chiang Mai, effective from January 1 this year, upgrading the existing consular services established in 1980. The Japanese Consulate is located at the Airport Business Park and has jurisdiction over and provides services in the Northern Thai regions of Chiang Mai, Chiang Rai, Lampang, Lamphun, Mae Hong Son, Nan, Phayao, Phrae and Uttaradit provinces. The Japanese government took this upgrade after consideration of various important factors, meeting the increasing needs for consular services in Chiang Mai commensurate with the increasing number of Japanese living in the Northern Region. Japan believes it is also responding to increasing interest in the Japanese language and culture as the increasing number of language schools and exchange programs are established here following more interest expressed by Thai students. The Japanese community has also requested help to facilitate economic cooperative activities in northern Thailand with Chiang Mai as the center. Deputy Transport Minister Vichet Kasemthongsri has declared 2004 to be the year of new airports with potential landing places mushrooming throughout the country in line with the government backed launches of many low-cost airlines. Approving the scheme last week, Vichet said that he had assigned the Department of Civil Aviation to conduct an urgent feasible study into the construction of a state-run airport on Samui Island, in the south of Thailand. This would serve the increasing number of tourist arrivals to Thailand and operate flights with the current commercial airport there. The study, costing 500 million baht should be completed within three weeks. He added there were other possible locations for constructing new airports where large numbers of visitors would recover the high investment costs, including a local airport in Pai district, Mae Hong Son and in Uttradit province in the North. He believes that air travellers will go from 8 million to 20 million within the next five years. The Federation of Thai Industries (FTI), Lampang province, is fighting the price increase of 1 baht per kilogram of liquefied petroleum gas (LPG) following the announcement made by the Energy Policy and Planning Office (EPPO) in December. The federation claims the retail price for LPG has risen to 15.80 baht per kilogram, and is the fifth price increase since May 2000 when it was 10.75 baht per kilogram. The EPPO still wants to let the price for LPG float, making it vulnerable to other market factors such as transportation. This will adversely affect the northern region of Thailand, it is claimed. Industries which are affected by the increasing price of LPG are the ceramics cottage industry, dried longan factories, food processing industry and wax industry. The quantity of LPG used in Thailand is approximately 200,000 tons per month, of which 20,000 tons are used in the Northern region. The FTI has requested the government assist in the LPG pricing structure by decreasing the price from the refinery and severing the nexus with Middle East oil prices, exempting LPG from import tax, decreasing the excise tax and establishing the LPG Fund to compensate the transportation fees. Chiang Mai Governor Suwat Tantipat said that there are still many people in Chiang Mai province suffering from the cold weather, with most of them living in rural and remote areas in the mountains. The cold weather has continued longer than in many previous years. As a result, Chiang Mai authorities and other organizations have surveyed the number of blankets needed, including protective equipment needed in these areas. The survey found that more than 70,000 blankets are needed, but only 35,000 blankets and 25,000 sweaters have been donated. Anyone who wishes to donate blankets or protective equipment can contact the Provincial Red Cross, Chiang Mai Chapter or Chiang Mai Provincial Office’s Disaster Relief and Prevention group at the City Hall. 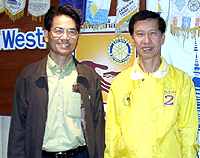 During a recent meeting of the Rotary Club Chiangmai West, Chiangmai Mail had the chance to talk to the Chiang Mai Preservation group which consists of academics in various fields, including architecture and city planning, administration, law and medicine as well as qualified consultants in the area of Chiang Mai City. The team members of this group seem to be in agreement that the mayor electoral process must be conducted by team members of a clean, moralistic nature, understanding of culture as well as the general area of Chiang Mai. Left: Dr. Anusorn Khunanusorn (deputy mayor candidate, technical affairs), Ph.D. Business Administration, University of Mississippi, USA, director in charge at the McCain Institute, and right: Dr. Niwat Tantayanusom, (mayor candidate), Ph.D. in Urban Planning, RMIT, Melbourne University, Australia, former Chiang Mai councilor involved in technical and educational affairs. The Chiang Mai Preservation group under the leadership of mayor candidate Dr. Niwat Tantayanusorn wants to implement an ethical administration policy, with application of ethics in politics, the eradication of sinful practices and the suppression of corruption. They want to try to improve the local maintenance taxation rating system for all businesses, to prevent under the table tax collections, establish support funds for community activities and manage an orderly community environment. Yee Se goes Yee Hah! Pha Muang Task Force, together with the Office of the Narcotics Control Board (ONCB), Drug Suppression Police of Provincial Police Bureau, Region 5 and the Northern Regional Drug Control Center mounted a joint effort to confiscate the property of major drug dealer Chaiwat, otherwise known as Lt. Col. Yee Se Pornsakulpisan. This required 18 targeted areas covering Chiang Mai and Chiang Rai. 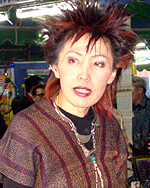 The principal target in Chiang Mai was the confiscation of property in the name of Pannee Pornsakulpisan, Yee Se’s wife, and a house belonging to Jainwit Sookanapasawat, Yee Se’s cousin. In Chiang Rai, one target was the property of Nongnuch Pornsakulpisan, Yee Se’s sister and the residences belonging to Yee Se at Mae Fa Luang. The total value of the seized property was around 10 million baht. During the seizures, no other drug suspects were found and it was assumed that they had all already escaped into Burma. Maj. Gen. Manus Paorik, Pha Muang Task Force commander said that Yee Se’s network was the largest Lahu drug dealer system in Chiang Rai province. Lt. Col. Yee Se was a business partner and close aide to Khun Sa, the former drug kingpin in the Golden Triangle, and is the leader of the Lahu Burmese volunteers, living in Ban Nam Pung Mai, Ban Sam Pee on Burmese side of Mae Fa Luang district, Chiang Rai. Thai authorities will contact the Burmese government asking for their cooperation in the suppression of this drug dealer network. CMU will be once again the host to some high caliber events of ‘Bridges’ - dialogues towards a culture of peace - hosted through the International Peace Foundation as a contribution to ‘The Decade for a Culture of Peace and Non-Violence’ initiated and promoted by the United Nations Assembly. Thursday, January 15, at 2 p.m., Prof. Nicolaas Bloembergen, Nobel Laureate for Physics will give a keynote speech and dialogue at Chiang Mai University: “Science and global communication based on optical science and technology”. His theme is “Laser Technology in Peace and War”. Prof. Nicolaas is a pioneer in the field of nuclear and electron paramagnetic resonance, later in quantum electronics, microwave masers, non-linear optics and lasers - of which he is one of the founders. 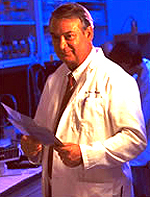 The second Nobel Laureate on that same day will be Prof. Ferid Murad, a Nobel Laureate for Medicine, who discovered new properties of Nitric Oxide which led among others, to the development of Viagra. His keynote speech will be at 3.p.m. at CMU. Wipada Treesat, of the Chiang Mai Provincial Commerce Office, in charge of the promotional campaign launched for OTOP markets. said that currently Chiang Mai has many high potential OTOP products of which 66 are outstanding. The best OTOP products from Chiang Mai include 10 for the export market, 30 for the domestic consumption and the other 26 products are provincial products. During the 2003 OTOP marketplace promotion they saw an increasing number of orders and sales for the manufacturers much greater than the expected target. Last year’s Chiang Mai OTOP products were expected to peak at 420 million baht but the final figures were closer to 600 million baht. The target for this year has been raised to 800 million baht, a figure which everyone feels is attainable. The first day of registration for the post of Chiang Mai mayor and its municipal members was colorful, active and it looks as if there will be strong competition between the local political parties. Members of the Chiang Mai Khunatham Party also registered for the election as candidates for Chiang Mai Municipality Council members. On the morning of January 2, two parties registered for the upcoming election set for February 1, 2004. These were the Chiang Mai Khunathame party led by outgoing mayor Boonlert Buranupakorn, along with his 24 members vying for the municipality’s four districts. This party was also supported by some MP’s from both Chiang Mai and Lamphun, led by Pakorn Buranupakorn, the Chiang Mai MP from the Thai Rak Thai Party. Boonlert Buranupakorn, the former mayor and the leader of Chiang Mai Khunatham Party showed up in person to throw his hat in the ring for the election of Chiang Mai mayor. The Chiang Mai Rak Chiang Mai Party, under the leadership of Dr Niwat Tantayanusorn, a Chiang Mai leading businessman, also showed up for registration for the mayor and municipal council members at almost exactly the same time. Chiang Mai Khunatham Party sent all 24 candidates and chose 7.29 a.m. as their auspicious time, while Chiang Mai Rak Chiang Mai Party chose 9.10 a.m. as their auspicious time but did not send all candidates to cover all 4 districts. For the local people it will be an exciting time at the polls next month. 3rd Army to the rescue? The Third Army Region is busy with preparations for sustainable development in 30 rural villages situated opposite the Thai-Burmese border, which will hopefully solve the drug problem and create more stability there. Maj. Gen. Nakhon Sriphetpan, deputy commander of the 3rd Army Region said that the government through the Mae Fa Luang Foundation had progressed with the development work in Ban Yong Kha inside Burma under the control of a Burmese minority group. The drug problem situation in the villages is getting better, as the development project has helped people by setting career development programs for the people, supporting sustainable agriculture for people to be able to make a living, plus plans for economics, public health, and education. “If people have their own career and sufficient income, they will not create any problems in the villages, especially as regards the drug problem,” he noted. The Third Army’s preparation for more sustainable development in the 30 villages on the border should prevent drug smuggling into Thailand, the illegal immigrant problem, improve national security and alleviate economic problems in the border areas. Burma has agreed with the Thai development project and has offered cooperation in the project as well. After they saw the progression of the sustainable development of Ban Yong Kha, the pilot project, they will shortly allow the development scheme in the 30 border villages. Chiang Mai orange growers around Fang, Mae Ai and Chai Prakan districts are confident that their products are safe and meet the government’s targeted food safety policy. Vinai Laotherdphong, from Chiang Mai Provincial Agriculture Office, said that Sai Nam Phueng oranges from those districts were guaranteed five star quality and strictly controlled by Chiang Mai authorities. Chiang Mai Governor Suwat Tantipat has encouraged the local farmers to reduce the use of chemical pesticides in agreement with government policy and measures on food safety announced January 1 this year. After local growers enter this process, all of their products would receive standard certification from the Agriculture Department. He insisted that orange products from theses three districts have been strictly supervised during production, are free of all problems and meet export regulations. Villagers from Hot district have presented a request to the Commissioner of Provincial Police Bureau, Region 5 asking his officers to investigate and recover their thousand years old Buddha statue stolen recently. Sa-ngob Kantakaew, the village headman of Tambon Hot, and more than 20 of his people saw Pol. Lt. Gen. Chalor Chuwong, the commissioner, regarding three stolen Buddha statues of which one of them was very valuable. That Buddha is known as Luang Por Kiew, and is more than one thousand years old. The villagers have posted a reward of fifty thousand baht to anyone who gives information leading to arrest of the thieves and return of the ancient Buddha statue. The three Buddha statues were stolen from Wat Luang, by forced entry from the Viharn into the temple. Police commissioner Pol Lt Gen Chalor told the villagers that he would do his best to put together an investigation team to trace and recover the Buddha statue as soon as possible. Pittaya Jinawat, director of the Office of Narcotics Control Board (ONCB), Northern Region, has strongly suggested people carefully check their personal belongings before departures to prevent them becoming innocently involved in drug trafficking. During the New Year’s long holidays, many tourists and travelers were flowing into the North, especially around the dangerous border areas, so tightening security and issuing an alert to related departments and agencies was in order to prevent illicit drug smuggling. The ONCB director added that brand new drugs had been found, but the most usual one was the methamphetamines, which were modified in physical appearance by making them look like ordinary items such as noodles. International drug smuggling rings were also looking for innocent travellers to carry the illegal drugs into the country. Chiang Mai Private School Association and the Preschool Department jointly organized a camp for children called “Kids love Nature Project” at Lan Suan Som (orange orchard grounds) in the Queen Sirikit Botanical Park, Mae Rim district. This project was to make the children learn to love and care for the natural resources, such as trees, plants and forests including teaching children to have an interest in the relationship between animate and inanimate objects and to develop an enquiring mind. This activity was also designed to strengthen the close relationship between the 300 students and 60 teachers from 31 schools in Chiang Mai and Mae Hong Son provinces. “Ministry of Justice meets the people” is offering services to people in the North on January 10 and 11, at the area behind Chiang Mai City Hall. The concept is to enable people to understand the information, the role and the vision and mission of organizations under the umbrella of the Ministry of Justice. Pongthep Thepkarnchana, the Minister of Justice; Yaowapa Wongsawas, Chiang Mai MP and Somchai Wongsawat, Permanent Secretary of Ministry of Justice cut the ribbon marking the opening of the mobile ministry. In the progression of law development and administration to protect the right and independence and freedom of the people, the Ministry of Justice has decided to publicize and give information to the people on its work. Deputy director of the Forensic Department, Dr Khunying Pornthip Rojanasunand also joined the “Mobile Justice Ministry”. 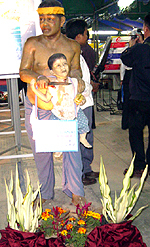 Various activities will be presented on the two days such as an exhibition of the justice process, the duty and performances of the Ministry of Justice, consultations given by specialists on the justice issues, a performance from the juveniles of the Juvenile Observation and Protection Department, performances from inmates of the Department of Corrections (Houdini displays? ), quizzes and other entertainment activities from 10 a.m. to 9 p.m. nightly. For the next Mobile Justice Ministry, the Ministry of Justice has planned to give further information to people in the North-Eastern part of the country beginning in February 2004 in Udon Thani province. This bees wax model shows the danger of ya ba. The 10th Public Health Center Chiang Mai held a workshop to emphasize the four main factors; exercise for health, clean food - good taste, fresh market, and livable city. Dr Soisa-ang Settawanich, the director of the 10th Health Center Chiang Mai said at the workshop that following the government’s policy for 2004 on the promotion of being healthy, the center has already begun to publicize this project. He quoted that to support exercise for health, there will be more public parks for people to exercise in and more health clubs should be set up to serve people who love exercising. As regards clean food - good taste, this project will focus on the hygiene of food preparation and the taste of the food. Certificates will be given to shops that provide nutritious food. In the fresh market they will ensure it provides fresh fruits, fresh vegetables and fresh meat. Cleanness is also important. The final spoke in the health hub is the livable city, a project that will focus on people - how to make city dwellers healthy, which will produce a healthy country as well. The director added that the center has already prepared the staff for the project and to publicize this to the community. Good health is not for sale in the shops, but one can build up good health by exercising and eating nutritious food, she said. In the aftermath of the recent Phaya Nak controversy, time is opportune to visit Mae Sai in the Golden Triangle. The booming wild north of Thailand is reached by Highway No.1 from Bangkok, a mere 890 km, or by a side trip from Chiang Mai via Wiang Papao and Chiang Rai, a constant 240 km vista of green mountains and river valleys. This 7.80m long fish was supposed to give credit to the legendary stories that “nagas” as a kind of mythical creatures live in the river. But the fish is an import from the ocean near California and the photo was brought over from America to fool the world. Reaching the bustling market town of Mae Sai, entitles you to cross into Myanmar on a one day visa until 5 p.m. in the afternoon. The border formalities are straight forward and will take not more than half an hour and a couple of baht on both sides of the border. For sightseeing in Tachileik, also called the “City of the Golden Triangle”, a walk through the local market next to the bridge on the right side is highly recommended, even though there are the same bargains offered as on the Thai side of the border. But the local flair of Myanmar is remarkable with busy Indian merchants and mostly Chinese merchandise. Here it is possible to get a photo of the big oar-fish that an American Army unit seized at the Mekong River in Laos on June 27, 1973 with the length of 7.80 meters. In this beautiful old Wat is the local Mahamyat Muni Buddha Image, the holy protector of the town. This fish gave credit to the legendary stories that “nagas” as a kind of mythical creatures live in the river and are not only fantasies from the local population along the river. As a fact, in the meantime, we know that the fish is an import from the ocean near California and the photo was brought over from America to fool the world. Mai Sai-Tachilek is also an international border in the Greater Mekong Sub-Region. For tourists it is possible to get an entry permit for a fee of 650 baht per person, bringing 3 passport photos and 2 set of passport or Thai identity card copy with you. Besides, you can bring your own Thai registered car into Myanmar, paying 30 US$ for a 4 seater, 50 US$ for a 5-7 seater and 100 US$ for an 8 seater and above. A pot-holed, but upgraded 167 km long and winding road brings you to Kyaing Tong within 3 hours, passing some interesting hill tribe villages on the way. There, it is a further 83 km to Mong La, an ethnic Thai Lue settlement at the Chinese border to Sipsong Panna. It is still not possible to continue to Jinghong at the Mekong River. Fortunately, China’s Jinghong can be reached nowadays with Bangkok Airways from Chiang Mai and Bangkok. Nearby is the area of the former local king’s palace that was demolished some years ago by the Burmese military to give way to a new hotel complex. Furthermore, there is an attractive morning market, where the atmosphere of a bygone time comes alive. Besides the local Shan population, the daily market is a melting pot of valley and mountain people, including the Burmese, Chinese, Indians, Akha, Lahu, Lisu, Palaung and Wa. Christians, Muslims and Buddhists rub shoulders. Monasteries and pagodas abound, along with a Baptist and Catholic church, and a mosque. The local Mahamyat Muni Buddha Image is the protector of town. The Burmese Army is responsible for law and order, suppressing any kind of nightlife. But that is out of control in Mong La, where casinos and karaoke bars dominate the border town. Not surprisingly, many curious Chinese tourists from across the border attend the daily “katoey” shows there as the highlight of their day tours into Myanmar. A local opium museum functions as a showcase for the eradication program of the Burmese military government. Interesting to note is that the whole area belongs to the Wa Special Economic Zone. Another development is the construction of the Second Friendship Bridge across the Mae Sai River to facilitate the road linkage between Kyaing Tong and Chiang Rai. The site location is at Wan Mae Khao in Myanmar, approximately 2.5 kilometers east of the very narrow ‘First Friendship Bridge’ over the Mae Sai River. The length of the new bridge will be 90 meters. But will Phaya Nak allow the implementation of this ambitious project to combine such newly emerging destinations in the Greater Mekong Sub-Region? Chiang Mai Winter and Provincial Red Cross Annual Fair 2004 will come to an end January 11. It was opened on December 30, 2003 by Chiang Mai Governor Suwat Tantipat; Chiang Mai MP and the deputy leader of Thai Rak Thai Party, Yaowapa Wongsawas, and Minister of Justice Pongthep Thepkarnchana, all of whom jointly presided over the opening. 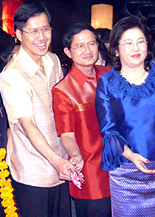 Chiang Mai Governor Suwat Tantipat (L); Minister of Justice, Pongthep Thepkarnchana (2nd L); Permanent Secretary of Ministry of Justice, Somchai Wongsawas, (2nd R) and deputy leader of Thai Rak Thai Party Yaowapa Wongsawas (R). This year the winter fair is different, being under the Chiang Mai governor’s concept of “Green and Clean” after many people complained last year about the dust problem. As a result, the governor has planted more trees and is suppressing dust by sprinkling the road with water before the fair opens each day. New Year basket with colorful and various types of flowers. The fair has many interesting events and products for sale. For example, the fresh fruits and vegetables from the Ministry of Agriculture including tips and knowledge on agriculture, many booths displaying local products, lucky prize draws from Red Cross with items such as motorcycles, televisions, electric fans (during the winter time! ), bicycles, and warm blankets up for grabs. Anyone who has yet to visit the fair should do so now, before all the bargains have gone. Phuket Airlines Co., Ltd. (Phuket Air) in cooperation with Chiang Mai Public Relations Office and Dusit Island Resort, Chiang Rai is launching a special project for children titled, “Traveling around Thailand with Phuket Air” to support the National Children Day which is designated on January 10, 2004. This project is aimed to optimize the children’s education and vision. The young learners had a chance to experience a nice fly from Chiang Rai to Chiang Mai. On the day of excursion, Thursday, January 8, members of Phuket Air escorted the kids with good care. Their alliance enterprises, Chiang Mai Zoo, Maesa Elephant Camp & Nursery, Buffalo Farm, extended a truly warm welcome to the young travelers who were lucky to see lovely creatures such as “Kham Eai and Kham Ai” at Chiang Mai Zoo, talent & artistic elephants at Maesa Elephant Camp & Nursery as well as typical Thai buffalos at the Thai Buffalo Farm. Phuket Air aims to support community and children’s education and let’s hope that this project is another step in implementing kids’ knowledge and experience.